After leaving Jelly and Charlie we discovered that we had to head back to Capurgana to get our boat across to Panama. For those of you that remember my thoughts on Turbo the first time we went there, you wont be surprised to learn that I was a little less than impressed to have to go back! At least we knew the journey would be better than the last time.... Or so we thought! ... errr... we made it?! Our bus from Cartagena to Monteria that was supposed to take four hours took eight, so we missed the last bus to Turbo that evening. We couldnt even find a private car that would take us there, for any price. We were told that the first bus went at 3am, and thaqt the best idea was just to wait at the bus terminal. A million mosquitoe bites later, we woke up and a bus left shorly after four. It was absokutely vital that we got to Capurgana on time or we'd miss our boat.... Oh the stress! The bus that we were on was also providing transport to hundreds of multi-coloured chickens... Flourescent green, orange, yellow and pink. Weird! Our boat to Turbo was full when we arrived, so we had to get on a boat to somewhere near and wait for another boat to take us over... It took over two hours, was over an hour late, and was quite possibly one of the dodgiest places I've ever been. Glad to see the back of it! On leaving Capurgana and arriving in Puerto Obaldia, we realised we had not gotten our passports stamped. So having met our captains at nine for a ten o'clock departure, we then had to get the boat BACK to Capurgana to get the stamp at immigration, (which didnt open until two) and then finally get our last boat to Cool Running 2, our yacht, home for the next five days, and transport over the Darien Gap! The trip on the boat took us through the San Blas Islands, literally one of the most beautiful places I've ever been. The snorkelling! The islands are so beautiful and the snorkelling on the reefs around them is incredible! To list some of the fish I saw: Spotted Eagle Rays; Stingrays; a Peacock Flounder, a apotted Stingray; Prokfish; Blue Tang; Sergeant Major; Foureye Butterflyfish;Fairy Basslet; Barracudas; Everytype of Parrotfish! ; Bluehead Wrasse; Angelfish (french) Morays; trumpetfish; Yellow Goatfish; and many many more! The Captains! George and Sandra have owned Cool Running 2 for fourteen years now and are most certainly used to having more than just two people on their 44 ft yacht with them! They are Austrians who got bored of being in Austrai and now pay their way by payng tourists like us! We got on with them great and learned much from George who loves his stories and cooking tips! The Food! Being Austrian, they both know how to cook! We had Gulasche, Frittaten Suppe, fresh bread, pizza, spaghetti bolognese, pumpkin soup, coconut deserts, incredible breakfasts and lunches everyday! The most and well-fed we've been all trip! The Beaches! Isolated, one plam tree islands, with white sands and incredible reefs. Enough said. George was not a fan of people sleeping... Not good news after our long journey to reach the boat! He kept calling Gareth 'girlie' whenever he was having a doze, and tried waking him up wiht the boat horns and banging on his window! The job application. Gareth was applying for a job and we needed to send them in a video for him to do so. We are most certainly not tv presenters, cameramen or directors, and George and Sandra thought we were really weird when Gareth was citing his CV to the camera whilst sun bathing on the boat but it was good fun. Fingers crossed for the job! The wake boarding! In our own budget way, George took us wakeboarding on his small motorboat whilst we were anchored. It was amazing fun, unbelievably hard to hang on, and most certainly what I would call a 'bikini losing' experience. So many apologies were due after being dragged around the moored boats! The lightning storm. On our third nightb on the boat we were anchored in between four very close and very big storms, the result of which was lightning which literally lit up the sky constantly, and so close to us we could see fire as it hit the water. It was scary enough for all the electronics on the boat to be switched off. The thunder was louder than ever I've heard it and we had a few moments where all of our hearts stopped as we waited... literally sitting ducks! Terrifying, impresive, glad to have gotten away unscathed! The bugs. A new area, a new type of bug. Called 'Chitres'or something similar, they are tiny, really hgurt when they bite you, and stay looking gross and unbelievably itchy for three weeks. I got mauled (again) over 100 on each leg! George helped the situation by telling me that I couldnt scratch them or they would scar and then 'no one would marry you'. Thanks George, thats just great! George and Sandra had a fight whilst we were on board. Its bad enough getting involved in a domestic, but when there is literally nowhere to go its worse! George was in a foul mood for the rest of that day, Sandra only popped her head out to serve the food, and most definitely slept on the deck that night! So unbelievably awkward! With a fond farewell to the most stunning place EVER, we travelled on to Panama City! We were only there for a few hours as our bus out left that evening, but we did go and see the Panama Canal in action, very big, very canal-ly. 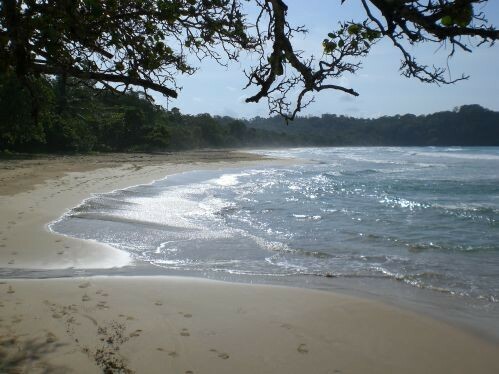 Our next destination just up the coast was Bocas del Toro! Another set of islands with lots of hostels and partying around too! The Beaches! Zapatillo, a national park beach there, was absolutely stunning, with great snorkelling, no people (for the majority of the day), white sand and lots of jungle in the middle of the island. Lovely! The hostel. Aqua Lounge is a hostel on stilts above the water, it has good parties, phenomenal pancake breakfasts, great staff, and swings you can jump off into the water! We arrived in Aqua Lounge and decided that we wanted a shower... It was then we realised that having been on the boat, this was our first shower in far too long to mention on here! The inevitable 'Mr Cool'. You know they type. There is always one. And here, we found the ULTIMATE one! The kind of guy who would describe himself as a ladies man, and who thinks he has everything every girl could possibly want. Only he is slightly deluded. He only ever wore boardies, thought he could dance like Michael Jackson, dive like Tom Daley, and had the looks of George Clooney. The best thing ever to watch, but cringey nevertheless. The vanishing swimmer. One evening, whilst people were jumping into the water, a grpoup of us saw this guy jump in and then swim under the borad walk, but didnt see him come out of the other side. Spooky, weird, we looked for him for ages but couldnt find him anywhere. He must have been ok though as no one mentioned a missing guy, but im pretty sure he was a wizard as he literally disappeared! So Panama was reasonably brief but beautiful and amazing fun. From here we left for our last country, Costa Rica! Scary how near to the end it all is!